Viewpoint Tickets - Best prices on Blue Jays tickets, Baseball tickets and MLB All Star tickets. Location: Center field (N), Front Street West; third base (W), Spadina Avenue; home plate (S), Gardiner Expressway; first base (E), John Street and CN Tower, the world�s tallest freestanding structure. Dimensions: Foul lines: 328 ft.; power alleys: 375 ft.; center field: 400 ft.; backstop: 60 ft.
Construction on the Rogers Centre started in April 1986, and the Blue Jays played their first game there three years later. In addition to baseball, the Rogers Centre hosts the Canadian Football League�s Toronto Argonauts, concerts, and a plethora of other sporting events. Because the movable lower stands are on rollers, and the Astroturf field rolls up, conversion from baseball to football takes only 10-12 hours. Opening or closing the roof takes only 20 minutes. The roof was closed during a game twice in the Blue Jays� first year in the dome, and four or five times a year since then. Blue Jays management decides whether it will be open or closed for regular-season games. 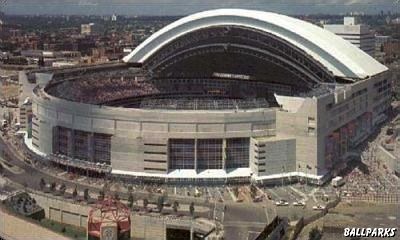 In the postseason, however, the American League dictated that the roof stay closed for each of the playoff and World Series games played at the Rogers Centre. Opening the roof requires that two panels slide over each other and into a section behind center field. A third panel, which starts behind the plate, rotates on a circular rail. The whole roof is 339,343 square feet and weighs 11,000 tons. 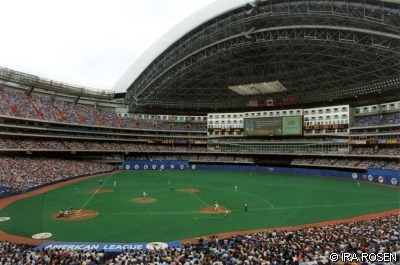 When closed, the Rogers Centre could hold a 31-story building, making it almost twice as high above the field as Minnesota�s Metrodome. Rogers Centre cost $500 million to build, financed by government and private industry. The Ontario provincial and Toronto city governments contributed $30 million each and 30 Canadian corporations paid $5 million each. Canada�s three major breweries also contributed $5 million each. The contributing corporations each received one of the stadium�s 161 skyboxes, which normally cost between $150,000 and $225,000 a year. They occupy the third and fourth levels of the five-level stadium,as do some of the Rogers Centre�s other famous features. A 650-seat restaurant rises above the center-field fence, and a 300-foot-long bar, sits atop that. The Hard Rock Cafe features some tables with a view of the field, as well. The ownership of the Rogers Centre, then known as SkyDome, filed for bankruptcy protection in November 1998, the same month in which the Blue Jays signed a new ten-year lease to play in the stadium. Sportsco International LP bought the stadium out of bankruptcy for $85 million (Canadian). In February 2005, Rogers Communications, the owner of the Blue Jays, bought the stadium for $25 million (Canadian). Site of the 1991 All-Star game. Jumbotron scoreboard is 33-feet by 115-feet and has 420,000 light bulbs, the largest in the world. Apex of the retracted dome is 310 feet making it the tallest in Major League baseball. The bullpens are located just behind the ten-foot-high outfield wall, so portions of the wall are made of chain link fence, allowing the managers to see who�s warming up on each side. A 348 room hotel is located in center field. 70 of those rooms have views of the field. On at least three occasions, spectators have been provided auxiliary entertainment by patrons inside the hotel during a game. The roof panels are made out of a single polyvinylchloride membrane over an insultated acoustic steel sheet metal. When the roof is open, the closed end of the stadium serves as a wind scoop which causes a downdraft in the outfield that tends to prevent home runs. The first postponement of a game in Rogers Centre history occured on April 12, 2001. A malfunction during a routine test of the roof caused two of the three panels to collide, sending debris falling onto the outfield. Several of the visiting Kansas City Royals players were taking extra batting practice at the time, but no one was injured. Ballparks: A Panoramic History by Marc Sandalow and Jim Sutton. 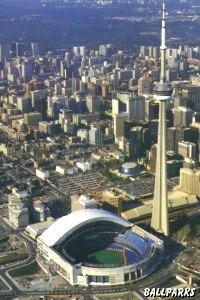 Aerial view of the Rogers Centre, CN Tower and Toronto by Munsey & Suppes. Close up view of the Rogers Centre courtesy of Jeff Wright. View inside the Rogers Centre © 1999 by Ira Rosen. Tickets to Blue Jays Yankees, NCAA Basketball Tournament, College Football Bowl, NCAA Football, Buffalo Bills, Paul McCartney and Toronto Blue Jays provided by Ticket Triangle. Thanks to David O'Connor for his contributions.